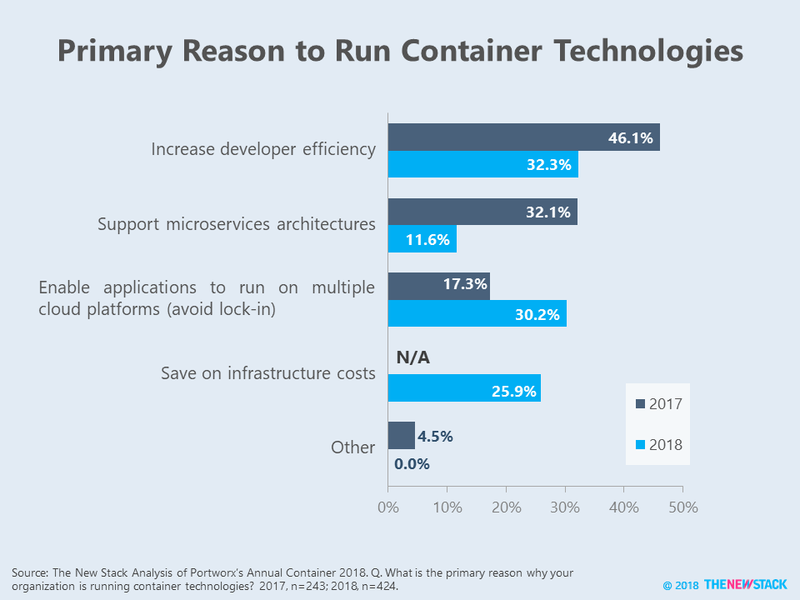 Running applications across multiple clouds are quickly becoming the chief driver for container usage, supplanting benefits previously touted, such as developer efficiency and support for microservices. In the latest edition of its Annual Container Adoption Survey, Portworx surveyed 424 container users, up from 250 in the 2017 version. 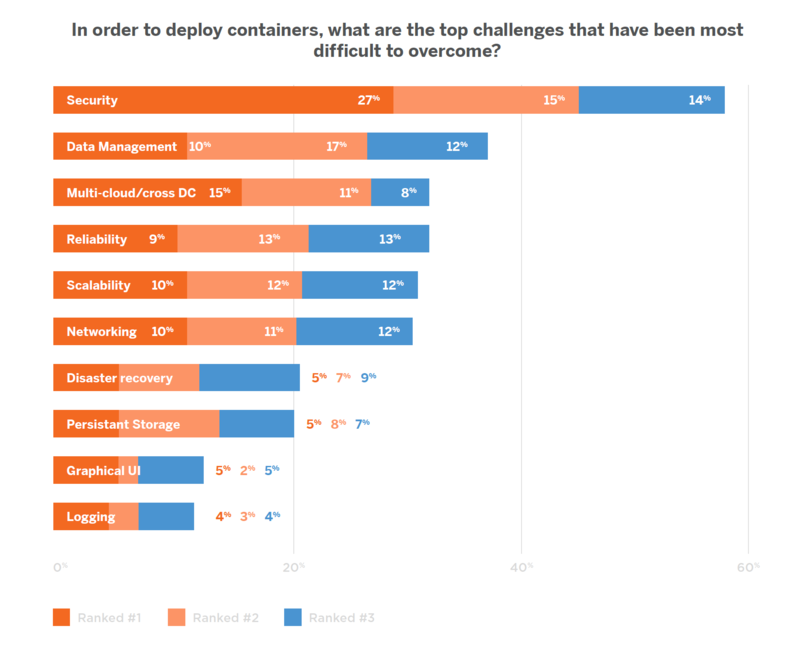 Based on this group of more mature container deployments, security, data management and multicloud are now the biggest challenges, with persistent storage becoming less of a concern. As we’ve seen repeatedly over the years, people claim that avoiding vend0r lock-in drives cloud computing choices but don’t actually use multiple providers. In fact, only 26 percent of those saying multicloud is why their organization runs containers are actually utilizing containers on more than one cloud. In contrast, 40 percent of those citing developer efficiency run containers on multiple clouds. Only 12 percent of respondents said support for microservices architectures drove container deployment, a dramatic decline from 32 percent in 2017. 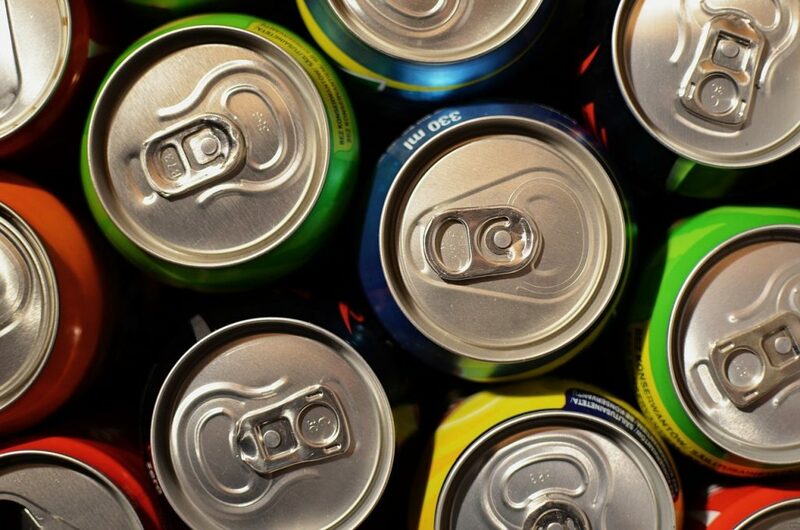 Added as a new choice in 2018, more than a quarter said containers were primarily used to save on infrastructure costs. Compared to containers, serverless continues to shine because developers expect greater efficiency if they don’t need to maintain server instances, as well as expected reductions in cloud infrastructure spending. Still, this group of container adopters tends to believe “serverless will make containers obsolete” as 41 percent agree with that statement and only 29 percent disagree. However, many respondents may not know that portability between clouds is the top area where serverless is falling short according to a recent The New Stack survey. If these troubles continue, the pendulum swings back to containers, but only if current container users stop saying multicloud is one of their top challenges. More than half of container users say security has been one of the most difficult challenges to overcome when deploying containers. 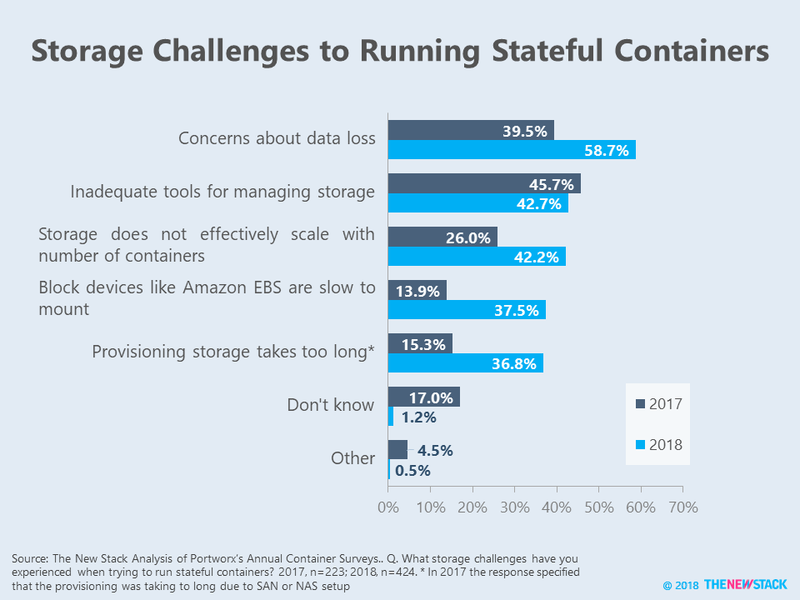 This stands in sharp contrast to last year when persistent storage was the top challenge according to question that was worded a bit differently. Data management’s higher level challenges have overtaken lower level concerns about persistent storage. Portworx Chief Technology Officer Gou Rao believes that storing and protecting data is “table stakes” that have begun to be addressed, which lets developers concentrate on issues like backup/recovery, migrations and copy-data management. According to connector-based container storage, EMC’s RexRay or NetApp’s Trident have problems with scheduler integration because they build data management capabilities on top of their underlying storage system. Security is by far the top challenge when deploying containers. Concerns about security may have risen since the previous survey as respondents are now deploying a significantly larger percentage of their applications on containers. This points to a larger point about storage. Conceptual concern about persistent storage have dissipated, but actual challenges have increased. When asked specifically what challenges they’ve experienced when running stateful containers, everything except for inadequate tooling rose compared to 2017. Gao thinks many people consider persistent storage to be a solved problem because the community has done such a good job standardizing interfaces for persistent storage, first with Docker Volume drivers and more recently with the Container Storage Interface. He said told us that although people can run stateful services with containers, they are struggling with “how” to do so. For more context, see This Week in Numbers: Container Preferences for Kubernetes. Portworx is a sponsor of The New Stack.